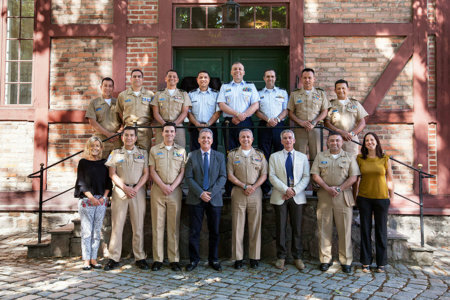 A group of high ranking officials (CAEM) from the Colombian School of War visited Norway in June. The visit was co-hosted by NOREF and the Norwegian Defence University College and builds on a long-term Norwegian engagement with the Colombian military. A comprehensive four-day programme was designed for the CAEM officers. The group visited the Norwegian Ministry of Foreign Affairs, where they were presented with Norwegian peace and reconciliation polices with a particular focus on the Norwegian engagement in Colombia. The military officials also received briefs by the Norwegian Ministry of Defence and by NODEFIC, on the Norwegian armed forces and on gender in the Norwegian military respectively. Moreover, thematics covered included the Norwegian welfare model, the participation in UN peacekeeping missions, the challenges of peace process implementation, and the political and military setup of NATO – which Colombia recently joined as a global partner. The week in Norway was concluded with a visit to the Army Land Warfare Centre in Rena, where the officials had the opportunity to exchange ideas with Norwegian counterparts. Norway has been supporting the project of dialogue with the Colombian military for 18 years and it aims at contributing to a better understanding of the peace process within the armed forces in Colombia, and to build trust between different sectors of society. This was the second visit of its kind since NOREF joined the project in 2014 and began a close cooperation with Social Development Group and the Norwegian Embassy in Bogota.